This post is the third part of the preschool series. A Language Arts "curriculum" for little ones is really the air they breathe. From the first time you hold an infant, you talk to her. And so language acquisition begins. Houses where children are educated at home tend to be print-rich environments where reading takes a high priority. That's as it should be. If we sit down to really plan a "curriculum" for the under-5 crowd, quality picture books must be its foundation. For Katie, those books will come from three sources initially and then hop merrily off on rabbit trails. The booklists are those found in the early years of the Real Learning list, and the ones found in the manuals of Five in a Row, and the list of books used in Catholic Mosaic. From there, we can go anywhere. A child learns to read most easily when she has a reason for reading. So, we give her one. We open those books all the time and we share with her the excellent stories and pictures inside. Doing so, we inculcate a strong desire to want to "own" those stories for herself. She wants access to the richness of language without having to depend on someone else to bring it alive for her. And so, with most children, the quest to acquire reading skills begins. To help her along the way, we provide much contact with the letters and print. 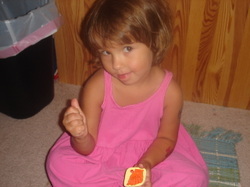 Real contact for a three- or four-year-old is tactile. Let's touch the symbols that stand for sounds. 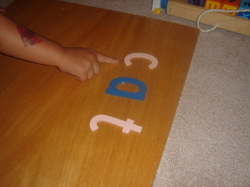 Sandpaper letters and a moveable alphabet are the gold standard in a Montessori classroom. We can use those certainly to present classic Montessori lessons. But I don't try to imitate a perfect Montessori classroom. 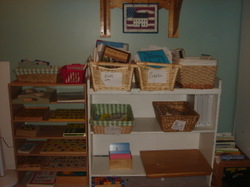 Our language arts shelf is not limited to authentic Montessori materials. I include several different alphabet puzzles, both in wood and in Lauri foam. There is also a chunky ABC picture block set and a magnetic ABC puzzle book. First and foremost, puzzles are fun. They are engaging and appealing and can be used over and over again by the same child for several years. A puzzle with alphabet letters (and sometimes pictures representing sounds) serves several purposes. 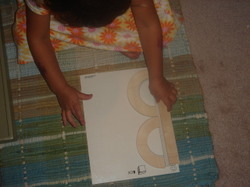 It develops fine motor skills and fine tunes visual perception skills. 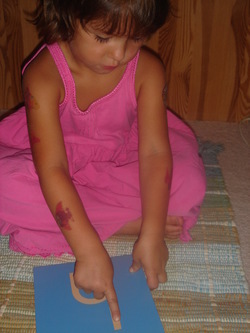 It allows a child to "get the feel" of the shape of a letter before attempting to make it abstract in the written form. Puzzles let children play with language from the very beginning and the best writers will tell you that composition is really playing with words. Begin great composition at the very beginning: nurture the sense of language play! Also on the language arts shelf is a wooden sign language puzzle. The pieces depict the sign language alphabet. Lift the pegged puzzle pieces and the print alphabet letters and an object wich begins with those letters are pictured below. This is the puzzle that began our sign language adventure. 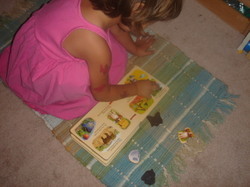 And it's this puzzle that led us to Signing Time and the wonderful DVDs that are a daily part of our language study. 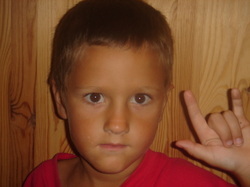 So much has been written about the benefits of sign language to hearing children. I'm firmly convinced that it is a valuable tool--not only for pre-speaking but for pre-reading. It's a tactile, kinesthetic way to represent abstract words. What could be better? The DVDs are engaging, endearing and effective. Lots of moms need that half hour television break--these are far better than most "educational" televsion shows. The only drawback? Instead of scurrying off to empty the dishwasher or fold laundry while the wee ones are engaged, you'll probably find yourself watching, too. Some Sign Babies flashcards round out our multi-sensory approach to signing. The decision to use Handwriting without Tears was one I made under protest. I loved the Italic handwriting that my oldest learned so easily. But when Christian really struggled with that and every other traditional handwriting program, I saw that this program, while not beautiful, makes a great deal of sense for the child. The letters are clear and legible and the entire program is laid out with the thought and care that an experienced occupational therapist can bring to the teaching of writing. For my children who can handle it, the switch to Catholic Heritage Curriculum handwriting books for copywork in the middle grades is nearly effortless. Not all of language arts can or should be confined to shelves. Singing songs, chanting Mother Goose, sharing CDs in the car, and drifting to sleep while Mommy nurses the baby and we all listen to bedtime stories are all a part of the picture. Don't forget lots and lots of Rhymes, Songs, and Fingerplays! We only get to be little once, but when we're really, really blessed we can revel in the joy of early childhood and see the bright hope of a happy today and a happy tomorrow through the eyes of our own precious child.